Way too optimistic to achieve this in 5 years IMHO. Even developed nations cannot achieve transition to EVs this quickly. Looks like a knee-jerk announcement. & What would people drive after 2024 ? More fluff than stuff, Amaravati, for all the hype around it, is getting nowhere because of the fund cut by the Centre, which is CBN's biggest challenge today. EVs are way down the priority list for any state, forget a nascent, upcoming state with multiple challenges. Also, even if Amaravati doesnt register IC engined vehicles, what stops someone from driving one registered at a different RTO in Amaravati? Though the intention is excellent, the idea of implementing this by 2024 will be too optimistic. Will we get enough charging station's by then? Will buying EV's be as economical as buying a petrol or diesel car? Am asking about the buying cost, not the running cost. To make the current petrol and diesel engines less polluting, every company is enhancing their engines to meet the BSVI norm. This norm will be implemented by 2020. So in next four years these engines will be of no more value? What other steps are they taking to control environmental pollution? Is it just limited to cars? The new EV policy will attract an investment of Rs 30000 Crore and the government has announced a state grant of Rs 500 Crore for EV R&D. 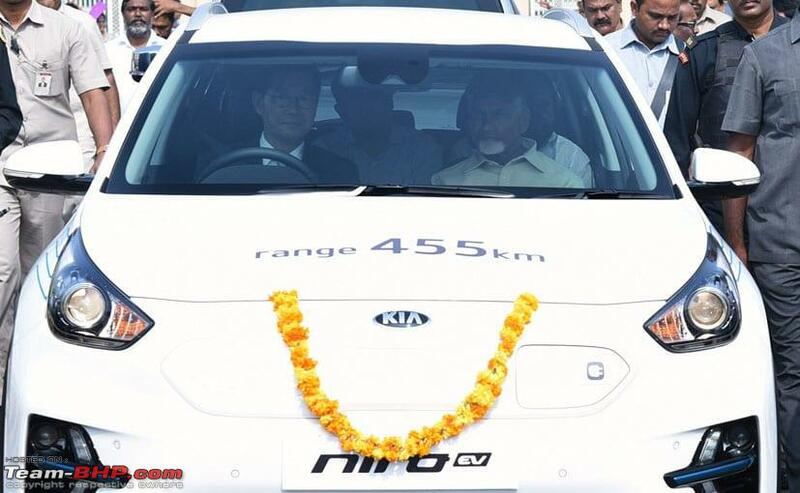 Andhra government is also hoping to put 1 million electric vehicles on the roads of Amaravati by 2024. Ain't spending this huge amount on R&d's for EV's be an overkill? This amount could have been spent on building a better infrastructure on public transport. Till now commuting by using public transport in most of the busy cities are a nightmare. Having good and comfortable public transport will itself lead many people to not use theirs cars regularly. They will happily save the fuel expenditure and use public transport. So, less number of cars = Less pollution too! Based on the current situation of our country, i truly feel the deadline of 2024 is too early. This looks more like a political stunt than a practical decision. Last edited by Samba : 8th February 2019 at 20:52. Its just a policy. They are thinking it will attract that much investment. That would include any manufacturing facilities etc. They are providing just 500 cr from their side. Not sure even if anybody will qualify to get that. Wow . What a bunch of retarded jokers !!! As of February 2019, I don't think 10 lakh ( 1 million) electric vehicles have been sold in one single country in one calendar year. Leave alone a state, that too in a third world country, in a state where certain national highways had only lane with the oncoming traffic forced to get down on the dirt until 5 years back. Clearly Andhra is no California with its wide spread charging infrastructure and India is no China which has most of the lithium ion battery production capacity in the world even before EVs came into the spotlight. These goals are a terrible joke even beyond being laughable. Last edited by Ragavsr : 8th February 2019 at 23:35. I'm just meh about such announcements. People in power don't know the reality. Charging points, highway travel etc are still barriers for implementations. Typical Indian mentality of jumping the queue. While many countries in western EU are looking at a 2040 timeline, this guy says 2025. I'd be so happy if they say they're going to give EVs tax-free till 2025, 50% the normal tax rate until 2030 etc. Ain't spending this huge amount on R&d's for EV's be an overkill? This amount could have been spent on building a better infrastructure on public transport. Funds are always mismanaged by our government. I don't need to explain any further. As of February 2019, I don't think 10 lakh ( 1 million) electric vehicles have been sold in one single country in one calendar year. If you consider plug-in hybrids (not non plug-in ones like Toyota hybrids) 1.1 million electric vehicles (or as they call it, New Energy Vehicles) were sold in China in 2018. @games_Goblin; Good. But I think Gujarat has beaten them to the start line. 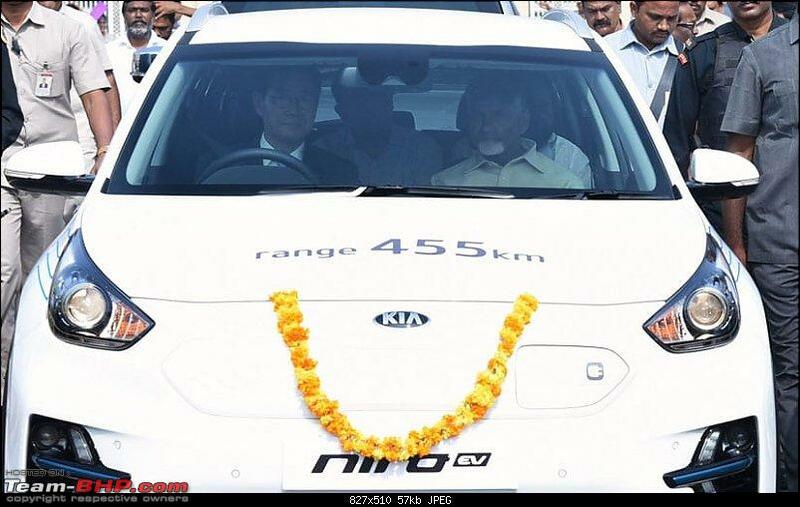 Will Herr Naidu be able to set up the infrastructure required to support an all EV transport system. Also, the breakdown services will have to the trained to cater to EVs in a big way. Good idea, but implementation I have my doubts. I feel encouraged that somebody is taking bold steps, eventually, even if AP fails am sure AP would have gone far ahead of states who are yet to figure out EV policy of their own. This seems to be out of some kind of understanding with KIA who has set up their shop in SriCity and will be producing EVs. Also, it does not augur well for capital intensive industry like the Car industry when each state comes up with own policies like this. One state after another coming up with EV idea without taking a single step in reality is hilarious. I won't be surprised if some state announce they won't register fuel cars from next year onwards. It doesn't cost to say anything you like to grab public attention. While these targets by AP govt seem very ambitious, there is some wrong info written in news18 article in the link. As per ET article, below govt aim is to have 10 lakh EVs on the road by 2024 across all segments (2,3 wheelers, cars, buses, etc...). Also as per ET article, the plan is to ban petrol/diesel cars over time, but there is no timeline set for that. Even local newspapers reported same. AP discoms are the lowest in the country with energy AT&C losses. Also ranked no.1 in the country in implementing UDAY power reforms. AP is the first state to achieve 1crore LED bulbs to households and distributed more than 2 crores in total. AP completed 1 crore bulbs in less than 1 year in 2015. At that time, AP share is 1/3rd of India's. AP is no.1 in LED streetlights installation in the country and only state to use LED streetlights even in villages. Gujarat is second with just half of what AP installed. In the last 5 years, AP is 3rd in installing renewable energy capacity in the country, only behind Karnataka and Tamilnadu. More than 6,000 MW of solar and wind capacity added in this time. There is another 2000 MW of capacity in pipeline for next 1-2 years. AP stopped adding new coal plants. If somebody said something like stopping new coal plants 4 years ago, everyone would have laughed or criticized similarly. With technology advancements, solar and wind getting cheaper made this possible. Andhra Pradesh started even more ambitious zero budget natural farming (zbnf). It aims to move all 6 million farmers in the state to zbnf by 2024. Over the last 3 years, 5.2 lakh people moved to natural farming. Some people are even criticizing Amaravati, saying its not going anywhere and just hype. I would suggest them to stop making comments based on few news articles or politician comments and visit the place to know the amount of work going in there even without central govt's help. Not a single project of such scale happened in Independent India so fast. From land pooling of 33,000 acres at a single place, constructing 6-8 lane roads of ~320 KMs length with underground drainage, electricity, gas, fiber cables, etc... developing the pooled land and returning them to farmers to constructing millions of sft of govt buildings (secretariat, judicial complex, temp. secretariat, assembly, high court, staff housing, etc...). Coming to EV targets, as mentioned in ET article above there is no timeline for banning of petrol/diesel cars. Other targets like 10 lakh EVs across all segments is achievable over next 5 years. Even if they could only achieve 5 lakh, that wouldn't be bad, will it? Someone said, no country ever sold 1 million vehicles in a single calendar year till now. China achieved 1 million EV car sales in 2018. Across all segments like buses, 2 wheelers number will be much more. Most people are underestimating the EV adoption. How many of you know, in China petrol/diesel car sales in December, 2018 are down by 22% compared to December, 2017. 2018 is the first time in 2 decades China posted decline in vehicle sales. While petrol/diesel sales down rapidly, EV sales grown by more than 70% in 2018. In next 4-5 years, we will see more Chinese companies setting up shop in India. SAIC (MG motors) already entering this year. Great wall motors planning to enter next year. BYD is already selling electric buses to different cities in India. Most likely they will start selling cars soon. As our companies are not investing much in EVs, I believe Chinese companies will rule the EV market even in India. China achieved 1 million EV car sales in 2018. Across all segments like buses, 2 wheelers number will be much more. Most people are underestimating the EV adoption. How many of you know, in China petrol/diesel car sales in December, 2018 are down by 22% compared to December, 2017. 2018 is the first time in 2 decades China posted decline in vehicle sales. While petrol/diesel sales down rapidly, EV sales grown by more than 70% in 2018. Promoting EVs is one thing. Banning internal combustion engines entirely is another thing altogether. It is up to the consumer to decide what he wants to buy and drive. The government should not decide for him (though they can certainly impose taxes and levies to discourage IC engine usage). So what happens to the "Make in India" program? In this scenario of different governments, courts, tribunals, ministers and politicians putting out conflicting signals about the roadmap for vehicular transport in the next 5-10 years, car makers are the most confused lot. Promoting EVs is one thing. Banning internal combustion engines entirely is another thing altogether. As I said in my post above, AP govt did not provide timeline of 2024 as suggested by new18 article, for banning of petrol/diesel vehicles in the state. 2024 timeline is only for targeting to have 10 lakh EVs on the road across all segments. Having said that, I agree with your points of letting people and market decide what they should buy and tax them higher to control pollution and ICE sales. Coming to other point of 'Make In India', these Chinese companies are setting up factories in India only like other international companies like VW, Ford, BMW, Hyundai, KIA, etc... Initially they may import few components from China but if volumes increases they will move more parts to India. GOI can force them to make components like batteries, motors in India through high taxes for imports similar to ICE vehicles. All times are GMT +5.5. The time now is 14:15.